Ashton’s Buildings on the Wakefield - Dewsbury Road at Flushdyke. The access to Spencer & Halstead’s is on the right, just before the Railway Bridge. The gable and roof of Brooke’s old mill can also be seen on the right background. 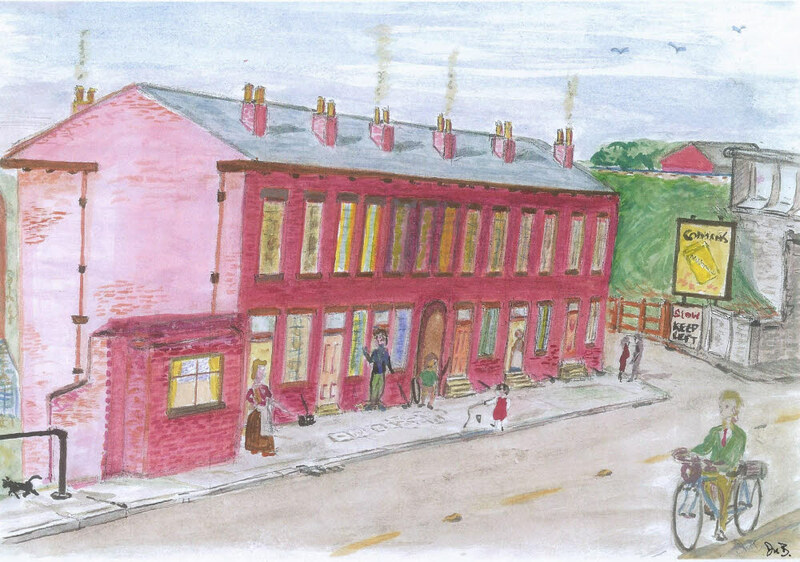 Ashton’s Buildings were back to back dwellings and the central “tunnel” to the rear of the block can be seen in the centre of the sketch. To the left a single storey shop can be seen and some of the characters who lived there. These included Mrs. Ashton, known for her “Ha wah” call to young children to go away, and the Henderson, Wilkinson, Silcock and Wilby families who lived here. Claude Wilkinson is shown on his bike in the foreground.